Will Ed Sheeran Collaborate With BFF Taylor Swift? E! 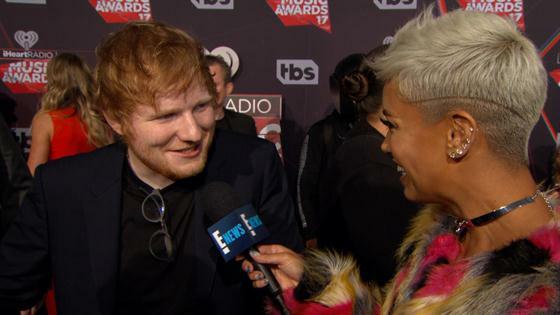 News caught up with Ed Sheeran as he walked the 2017 iHeartRadio Music Awards red carpet on Sunday evening in Los Angeles, where he revealed a duet with best friend and fellow pop star Taylor Swift is in the works. The "Shape of You" singer dished that a collaboration with T. Swift is "definitely" going to happen, though he played coy on any distinct timeline or release date for fans to look forward to. "Certainly in our lifetime," Sheeran added. Sheeran, who will perform new music from his latest album Divide onstage at the iHeartRadio Music Awards, has been quite the source of information lately when it comes to Swift's music career. "Taylor [Swift] isn't going to be releasing until probably the end of this year—Christmas is the smartest time to release because that's when everyone buys records," he dished during a recent interview with BBC News last week. "So I've got a full year of just all Ed, all the time." The "Bad Blood" songstress hasn't released an album since October 2014, when she dropped the Grammy-winning 1989, her fifth major record. Swift did release "I Don't Wanna Live Forever" last December, a duet with Zayn Malik that is featured on the Fifty Shades Darker soundtrack. Ed and Taylor previously collabed on 2013 track, "Everything Has Changed." Are you looking forward to a Sheeran-Swift mashup? Sound off in the comments!